I am SO excited to be joining the super talented girls over at Clearly Besotted, for their April Release. I have a card today using the new set called Design a Tree. SO cute, I tell ya! I can't wait for you to see the whole set! So I used one of my new favorite tags from Cleary Besotted, the Rounded Tag Die. I cut one tag out in white and stamped the image. And then I cut another out in Vellum to extend the the tag, and then heat embossed the sentiment. I added in a stapled piece of ribbon to finish the tag and then added it on to a scored card base. I used my Scor-Pal to make those 3 lines just for some added detail. I know the DT girls and the other Clearly Besotted guests have more to share! Click here to check out more peeks! Come back soon because I have some more new CB to share! :) Thanks so much to the sweet and talented Stephanie for having me and thanks for coming by today! Fantastic card, such a great CAS design. Love this design a tree set. I really LOVE your CAS cards, Laurie!!! Stunning!!! This is beautiful! love your stamping and scoring! Love the CAS style....very classy. Oh I love all the curved corners and love how you extended the tag with the vellum sentiment. Gorgeous! Gorgeous card! Fabulous tag and the new release you've showcased... swooning! Love this! I LOVE this card! I need to remember your idea of stapling the ribbon! MUCH better than tying a bow or knot! Pretty card Laurie, love that sweet little tag!! Laurie, that's a very beautiful card. The tree is very pretty and it looks great on the tag. I love the rounded tag and I think the idea to extend it with vellum is just great. Simply lovely I like that the color is coming from the tree great card! That little tree is adorable! Love the tag too! 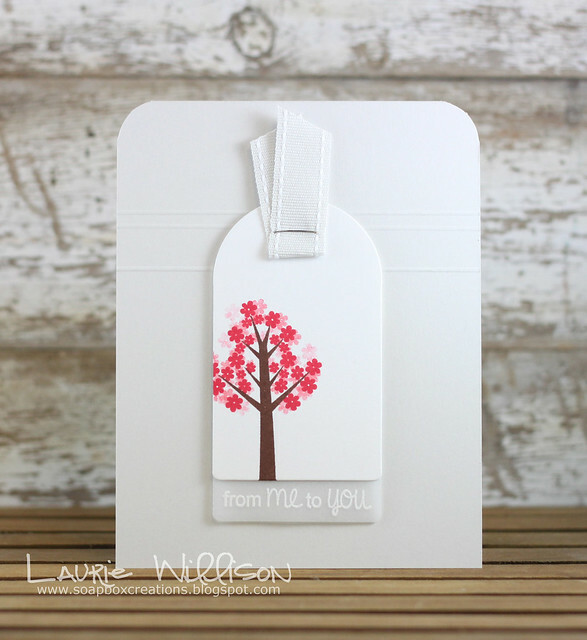 Ooooo...LOVIN' that adorable little tree and the new tag die!!! Super cute, Laurie!! Gorgeous as always Laurie - love that vellum edge. This is really stunning I love that tree.